Subacute onset of neurologic abnormalities including hallucinations, combativeness, muscle spasms, seizures, and focal paralysis. Detection of negri bodies or rabies antigen in animal or human brain tissue (70-90%). Rabies-neutralizing antibody in serum or CSF diagnostic in an unimmunized patient. 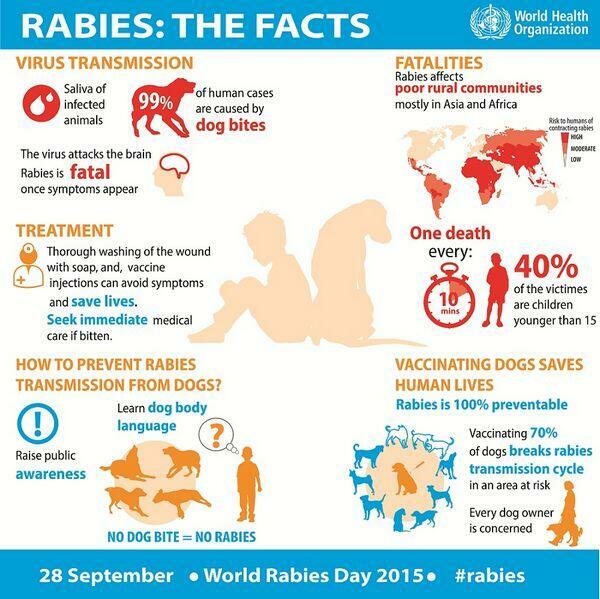 Rabies is an acute fatal viral illness of the CNS. It can affect all mammals and is transmitted between them by infected secretions, most often by bite. It was first recognized more than 3000 years ago and has been among the most feared of infectious diseases. It is said that Aristotle recognized that rabies could be spread by a rabid dog. Rabies exists in two epizooic forms: the urban form is associated with unimmunized dogs or cats and is essentially nonexistent in the United States; the sylvatic form occurs in wild skunks, foxes, wolves, raccoons, bats, and mongooses. Throughout the world there are striking geographic differences in specific animals. For example, raccoons are a significant reservoir of rabies in the southwestern United States but not on the West Coast; the bat is a frequent vector in Latin America, and the wolf in Eastern Europe. Rodents are not important vectors of rabies. Human or cattle infection is incidental, and does not contribute to maintenance or transmission of the disease. Human exposures may be from wild animals or from unimmunized dogs or cats. Domestic animal bites are the most frequent vectors in developing countries because of lack of enforcement of animal immunization. Infection in domestic animals usually represents a spillover from infection in wildlife reservoirs. Human infection tends to occur where animal rabies is common and where there is a large population of unimmunized domestic animals. Worldwide, the occurrence of human rabies is estimated to be about 15,000 cases per year, with the highest attack rates in Southeast Asia, the Philippines, and the Indian subcontinent. In the United States, fewer than five cases of human rabies are reported yearly. 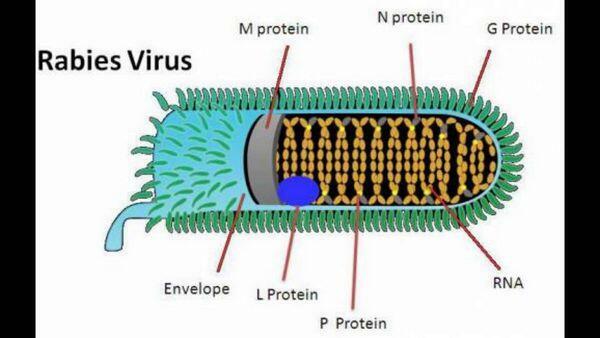 The rabies virus is a bullet-shaped, enveloped, single-stranded RNA virus of the rhabdovirus group. The virion is large, with a diameter of ~180 nm. Knoblike glycoprotein excrescences or projections, which elicit neutralizing and hemagglutination-inhibiting antibodies, cover its surface. In the past, a single antigenically homogeneous virus was believed responsible for all rabies; however, differences in cell culture growth characteristics of isolates from different animal sources, some differences in virulence for experimental animals, and antigenic differences in surface glycoproteins have indicated strain heterogeneity among rabies virus isolates. These studies may help to explain some of the biological differences noted, as well as the occasional case of vaccine failure. The essential first event in human or animal rabies infection is the introduction of virus through the epidermis, usually as a result of an animal bite. Inhalation of heavily contaminated material, such as bat droppings, eg, by cave explorers, can also cause infection. Rabies virus first replicates in striated muscle tissue at the site of inoculation. It then enters the peripheral nervous system at the neuromuscular junctions and spreads up the nerves to the CNS, where it replicates exclusively within the gray matter. It then passes centrifugally along autonomic nerves to reach other tissues, including the salivary glands, adrenal medulla, kidneys, and lungs. Passage into the salivary glands in animals explains transmission of the disease by infected saliva. The incubation period ranges from 10 days to a year, depending on the amount of virus introduced, the amount of tissue involved, the host immune mechanisms, and the distance the virus must travel from the site of inoculation to the CNS. Thus the incubation period is generally shorter with face wounds than with leg wounds. Immunization early in the incubation period frequently aborts the infection. The neuropathology of rabies resembles that of other viral diseases of the CNS, with infiltration of lymphocytes and plasma cells into CNS tissue and nerve cell destruction. The pathognomonic lesion is the negri body, an eosinophilic cytoplasmic viral inclusion distributed throughout the brain, particularly in the hippocampus, cerebral cortex, cerebellum, and dorsal spinal ganglia. Rabies in humans usually results from a bite by a rabid animal or contamination of a wound by an animal's saliva. It presents as an acute, fulminant, fatal encephalitis; human survivors have been reported only occasionally. The disease begins as a nonspecific illness marked by fever, headache, malaise, nausea, and vomiting. Abnormal sensations at or around the site of viral inoculation occur frequently and probably reflect local nerve involvement. The onset of encephalitis is marked by periods of excess motor activity and agitation. Hallucinations, combativeness, muscle spasms, signs of meningeal irritation, seizures, and focal paralysis occur. Periods of mental dysfunction are interspersed with completely lucid periods; as the disease progresses, however, the patient lapses into coma. Autonomic nervous system involvement often results in increased salivation. Brain stem and cranial nerve dysfunction is characteristic, with double vision, facial palsies, and difficulty in swallowing. The combination of excess salivation and difficulty in swallowing produces the traditional picture of foaming at the mouth. Hydrophobia, the painful, violent involuntary contractions of the diaphragm and accessory respiratory, pharyngeal, and laryngeal muscles initiated by swallowing liquids, is seen in about 50% of cases. Involvement of the respiratory center produces respiratory paralysis, the major cause of death. The median survival after onset of symptoms is 4 days, with a maximum of 20 days unless artificial supportive measures are instituted. Recovery is rare and has been seen only in partially immunized individuals. B. Laboratory Findings. Laboratory diagnosis of rabies in animals or deceased patients is accomplished by demonstration of virus in brain tissue. As negri bodies are not seen in at least 20% of rabies victims, their absence does not rule out the diagnosis. Viral antigen can be demonstrated rapidly by immunofluorescence procedures. Intracerebral inoculation of infected brain tissue or secretions into suckling mice results in death in 3-10 days. Histologic examination of their brain tissue shows negri bodies; both negri bodies and rhabdovirus particles may be demonstrated by electron microscopy. Specific antibodies to rabies virus can be detected in serum, but generally only late in the disease. Rabies may initially be mistaken for Guillain-Barre syndrome, an ascending peripheral polyneuritis, but encephalitic symptoms and signs do not develop in the latter illness. Pneumonia and other infectious complications of intensive care are almost invariable. Respiratory paralysis results from infection of the respiratory center. In the late 1800s Pasteur, noting the long incubation period of rabies, suggested that a vaccine to induce an immune response before the development of disease might be useful in prevention. He apparently successfully vaccinated Joseph Meister, a boy severely bitten and exposed to rabies, with multiple injections of a crude vaccine made from dried spinal cords of rabies-infected rabbits. This treatment emerged as one of the most noteworthy accomplishments in the annals of medicine (Box 3 and Prevention & Control section below for more information). Of patients with rabies, > 90% die owing to complications of the illness or progressive neurologic dysfunction, especially respiratory paralysis. Prevention is the mainstay of controlling human rabies. Intensive supportive care has resulted in two or three long-term survivors; despite the best modern medical care, however, the mortality still exceeds 90%. In addition, because of the infrequency of the disease, many cases die without definitive diagnosis. Human hyperimmune antirabies globulin interferon and vaccine do not alter the disease once symptoms have developed. Currently, the prevention of rabies is divided into preexposure and postexposure prophylaxis. This type of prophylaxis is recommended for individuals at high risk of contact with rabies virus, such as veterinarians, spelunkers, laboratory workers, and animal handlers. The vaccine currently used in the United States for preexposure prophylaxis uses an attenuated rabies virus grown in human diploid cell culture and inactivated with beta-propriolactone. Preexposure prophylaxis consists of two subcutaneous injections of vaccine given 1 month apart, followed by a booster dose several months later. This type of prophylaxis requires careful evaluation and judgment. Every year more than 1 million Americans are bitten by animals, and in each instance a decision must be made whether to initiate postexposure rabies prophylaxis. In this decision the physician must consider (1) whether the individual came into physical contact with saliva or another substance likely to contain rabies virus; (2) whether there was significant wounding or abrasion; (3) whether rabies is known or suspected in the animal species and area associated with the exposure; (4) whether the bite was provoked or unprovoked (ie, the circumstances surrounding the exposure); and (5) whether the animal is available for laboratory examination. Any wild animal or ill, unvaccinated, or stray domestic animal involved in a possible rabies exposure, such as an unprovoked bite, should be captured and killed. The head should be sent immediately to an appropriate laboratory, usually at the state health department, for search for rabies antigen by immunofluorescence. If examination of the brain by this technique is negative for rabies virus, it can be assumed that the saliva contains no virus and that the exposed person requires no treatment. If the test is positive, the patient should be given postexposure prophylaxis. Postexposure prophylaxis consists of immediate, thorough washing of the wound with soap and water; passive immunization with 20 IU per kg hyperimmune globulin, of which at least half the dose should be infiltrated around the wound site; and active immunization with antirabies vaccine (Box 4). With human diploid vaccine, five doses given on days 1, 3, 7, 14, and 28 are recommended. Physicians should always seek the advice of the local health department when the question of rabies prophylaxis arises.